Built to evoke the maximum amount of diamond fire possible, prong wedding are perfect for the modern bride. What makes prong wedding bands so special is the way they utilize small pieces of precious metal to secure the band’s diamond into place. Not only does this create a truly fabulous piece of bridal jewelry, it also allows for minimum obscuring of the stones, meaning that every prong diamond wedding band is of a next-level brilliance. For individuals looking for the perfect wedding band, now from the designers at Michael M come prong wedding bands made with gleaming 18-karat white, yellow, and rose gold, as well as stunning 950 platinum. Further, the prong wedding bands of Michael M can be a found in immaculate pieces that are sophisticated and subtle, to bands that are every bit as unique, unique, and stunningly beautiful bride-to-be herself. 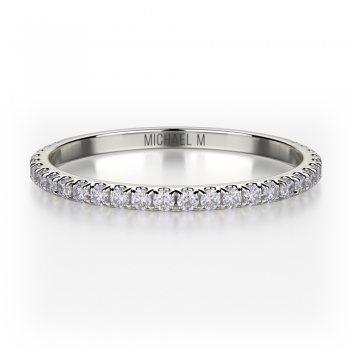 Available in a plethora of styles and fashions, the Michael M prong wedding bands on display now at Michael M retailers are truly second-to-none. 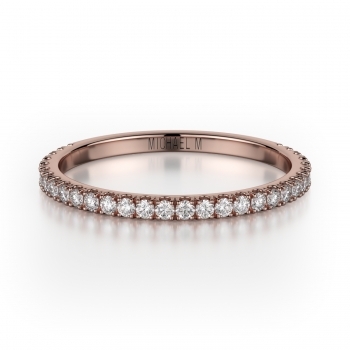 Popular prong bands include pieces like the Art Deco-inspired R306B and R396B bands that feature three rows of skillfully placed diamonds. Further, for the bride who prefers simplicity, the Michael M is proud to offer understated prong bands such as the R693B, R655SB, and R536B models, which are made with a single row of sparkling round diamonds. 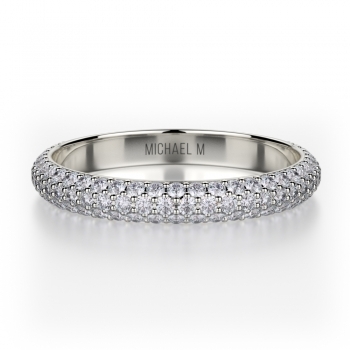 Also, in line with Michael M’s philosophy that "some traditions are meant to be broken,” available at authorized retailers are Michael M prong band models including the R440SB and R440B rings that reject the traditional idea of what a wedding ring should be, and are made with bold shapes that are sure capture anyone's attention. For years, the artisans at Michael M has been renowned for creating one-of-a-kind pieces of bridal and fashion jewelry artistry. The makers of a stunning variety of engagement rings, women’s and men’s wedding bands, as well as fine jewelry including diamond-covered necklaces, bracelets, earrings, and fashion rings. Committed to creating nothing but the best, every Michael M jewelry is made through a unique combination of traditional jewelry making techniques and fashion-forward styles, the result being a piece that is breathtakingly beautiful and totally one-of-a-kind. For individuals interested in exploring the wide world of Michael M bridal and fine jewelry, please visit the “Retail Locator” page to find an authorized Michael M retailer today!